Raleigh’s new Skarn will come in three builds, a sport, a comp and an expert. When you think of Raleigh Bikes in the 21st century, road bikes, or maybe even cyclocross bikes, may come to mind. And you probably know the brand has a strong foothold in cruisers. But in the past decade you probably wouldn’t have associated Raleigh with mountain bikes. 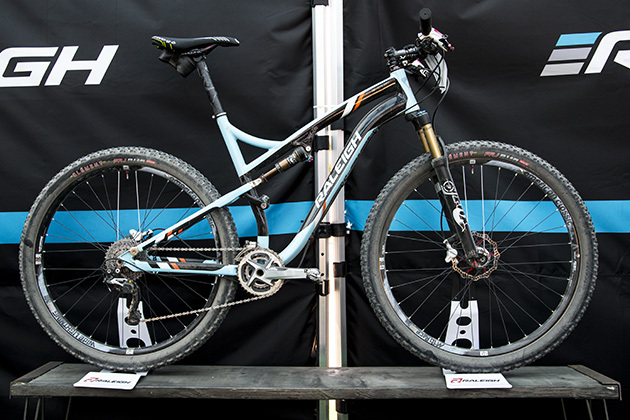 At this year’s Sea Otter Classic, Raleigh Bikes unveiled the Skarn, its first full-suspension race/performance mountain bike. Sporting a hybrid of carbon and 6061 aluminum in the frame build, the Skarn boasts 4 inches of travel through a highly ridged, single-pivot rear end. The front triangle and swing arm are made of 6061 aluminum, and the linkage and seatstay are carbon. Raleigh will be utilizing Enduro Max Black Oxide bearings for longevity, and the bike is built around 29-inch wheels. The Skarn is still in the pilot stage, but is expected to be available to the public around August. There will be three build options, ranging from $2,750 for the sport, $3,500 for the comp and $4,000 for the expert. The prototype pictured here was equipped with XTR and weighed in just over 25 pounds. The ‘cradled’ seatstay greatly increased the torsional stiffness. The rear end of the bike has some interesting features: The carbon seatstay has a ‘cradled’ design, which increases the torsional stiffness, and the rear derailleur hanger has a self-aligning thru-axle nut that is secured with cinch bolts. 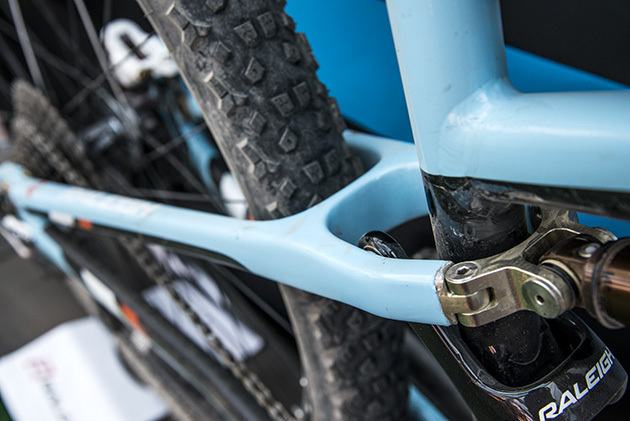 Mark Landsaat, the senior product manager for Raleigh, said the nut worked so well that Raleigh has also begun using it on some of its cyclocross bikes. Raleigh has been in the bike industry for more than a century, and while the brand may have let its mountain bike line fade over the past few years, with the Skarn, clearly Raleigh plans on making a stand in the dirt once again.